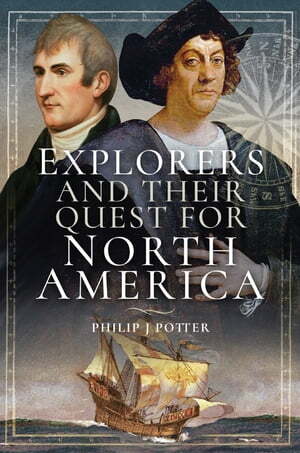 Collins Booksellers - Explorers and Their Quest for North America by Philip J Potter, 9781526720559. Buy this book online. On 11 October 1492 the sun set on a clear Atlantic Ocean horizon and the night was cloudless with a late rising moon. As the lookouts high in the riggings of Christopher Columbus’ three ships strained their eyes into the golden light of the moon, near two o’clock in the morning the watchman on the Pinta shouted out, “Land, land” igniting the era of exploration to the New World. The Age of Discovery became an epic adventure sweeping across the continent of North America, as the trailblazers dared to challenge the unknown wilderness to advance mankind’s knowledge of the world. Explorers Discovering North America traces the history of the discovery, exploration and settlement of the western hemisphere through the comprehensive biographies of fourteen explorers, who had the courage and inquisitiveness to search the limits of the world. The book features many famous adventurers including Hernan Cortes whose victorious battles against the Aztecs conquered Mexico for Spain, Henry Hudson’s sea voyages in search of the Northwest Passage led to the colonization of New York and exploration of the Hudson Bay in Canada, while Meriwether Lewis’ journey across the Louisiana Purchase began the mass migration of settlers to western America. Among the lesser known explorers discussed in the work are Vitus Bering whose discovery of Alaska established Russia’s claim to the region and Alexander Mackenzie’s 107-day trek across western Canada that opened the frontier to settlement, commerce and development of its natural resources. From Columbus to Lewis the exploration of the New World became one of humankind’s greatest quests that altered history forever.